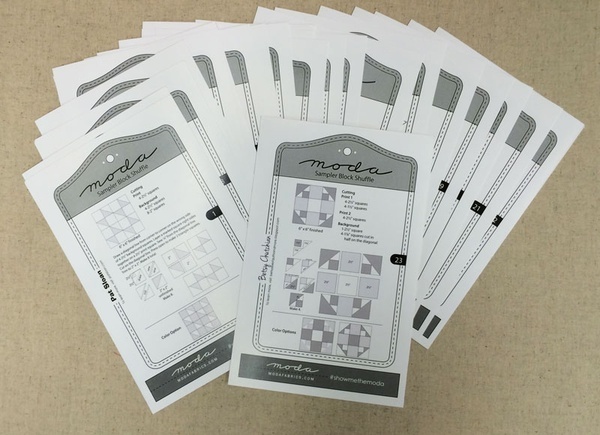 Welcome to Moda's Sampler Block Shuffle! This is a free Block of the Week program sponsored by Moda fabrics. New blocks will be added every Friday from November 2015 to January 2016. The blocks are available as free downloads, but they will only be available for a limited time. Each block will include 2 copies on the page, keep one and give one to a friend. You can also collect the set and add fabric to give as a gift. The program includes thirty - 6" square blocks each designed by a different Moda Designer. There are also setting instructions available which can be downloaded at any time. The suggested fabric requirements is 2 Jelly Rolls or 2 Layer Cakes - or one of each. They can be from the same collection or mix and match, your choice. Additional fabric will be required for the setting, back and binding. Don't forget to check back each Friday after 4:00 pm for the next set of blocks.